Today is my day at The Bug Bytes, but as always, I like sharing my projects here as well! For the full post, along with directions (including pictures), check out my post HERE. I have a dear friend's baby shower to attend today, and I really wanted this project to come out just right! I was inspired by a similar project I saw on the Cricut MB a while back, and decided this was just what I was looking for. 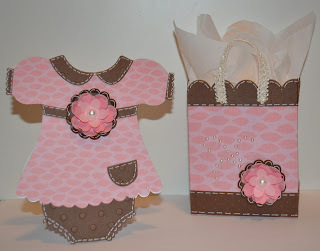 I made a shape card, and a mini bag to hold her gift card (I became a gift card giver at baby showers after I had my own...because you realize how much you still need AFTER the party is over lol! This is so adorable. I'll have to give welding a try. This is very good information and also all the picture are very much nice to see the all point thanks to sharing the wonderful information..
How cute is this? Love it!!! Totally adorable. I have always loved pink and brown together. Hi Roberta! Just love this. Any way to share the file. I've tried to recreate the card using Design Studio, but I'm having difficulty welding, flipping, etc. Any help you could give would be appreciated.